One non-snobby reason I like Waitrose is the very real commitment to local produce. And one of the reasons to rejoice about this policy is their selection of bottled ales from Sussex. Selflessly, I have taken it upon myself to shell out, stock up and tuck in for you, dear readers. Pullman is a delightfully refreshing and chuggable beer with a good hoppy taste and a very pleasing finish. Not overly bitter, it has a very bright even lively nature. This is a perfect summer evening ale. I chilled it a little more than suggested and was impressed by its light sophistication. Pullman is actually the perfect name: classy, traditional but with a bit of pace. As the bottle says, it’s a “first class ale.” My regret is that I only bought one bottle. Espresso is a good stout, which you’d expect from the afficionado’s brewery that “refuses to admit that the business is more than a hobby that got out of hand.” I have long been a fan of the oatmeal stout served on draft at the Evening Star in Brighton. A coffee inluenced beer is a concept too delightful to refuse. Regrettably, I’m not sure it really worked. I couldn’t really taste the coffee tones and just got something a little bit chocolaty (reminiscent of Fuller’s Double Chocolate). A good beer, but more coffee needed, I venture. And I say that as a coffee lover and therein may lie the problem. The Hogs Back Brewery (which is in Surrey) have been making some impressive beers and making a name for themselves in recent years. Their reputation gets better all the time and T.E.A (Traditional English Ale) is their signature beer pretty much. It’s smooth and well balanced and, well, just unfussy. Eminently potable. It’s bottle conditioned and they say it shouldn’t be chilled and served at 18 degrees. Well, I think mine was a touch colder and the more refreshing for it. In any case, T.E.A. is a venerable, competent but essentially unadventurous beer. Which is probably the point, because there’s nothing wrong with that. Peaches! Prospect is a peachy beer from Hepworth. Blossomy, fruity and exciting (and maybe a little fragrant for people who like their bitter bitter bitter) this is springtime in a bottle: it’s a walk in a beautifully scented garden. Bottle conditioned, I think this is a pleasingly unusual beer worthy of your time. Like the Pullman, it also comes in a beautiful bottle. I really love the designs the chaps at Hepworth come up with. It’s always seemed to me that one of the invisible lines in Britain delineates which brand of Ginger Wine you can get your hands on. Down south you’ll usually be putting Stones in your Whisky Mac. Further north, and certainly north of the Border: Crabbies. 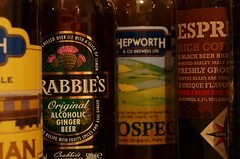 I imagine that in the summer months the sales of Ginger Wine wanes a little and Crabbies is fighting back. In my local boozer I can across and interesting new brew: alcoholic ginger beer. Deliciously sharp, but maybe a bit sweet, this is a tasty drink and I can’t believe there hasn’t been something like this on the market before. Like those pseudo-ciders, it’s served over ice and maybe with a slice. It’s 4% on its own but they suggest a shot of vodka might pep it up and it’s that which suggests it might be a bit of a children’s’ drink. Grown ups ain’t gonna chug many of these in an evening, but it’s a very refreshing summer drink. Wondering if the typos in the final review are indicative of the impact of the previous four tastings on the correspondent. Have just finished some work researching into lagers and was amazed to discover a world of gourmet UK lager microbreweries. Please Mr President, could we see a tasting foray into the fizzier, bottom-fermented side of the beer multiverse? I tried the dark star espresso during the summer, i found it more comparable to some form of narcotic. I drank a couple of pints and was absolutely wired. Fantastic beer. Could you recommend any similar?